After booting up PULP and answering a few basic questions about your hardware you should see the PULP desktop. 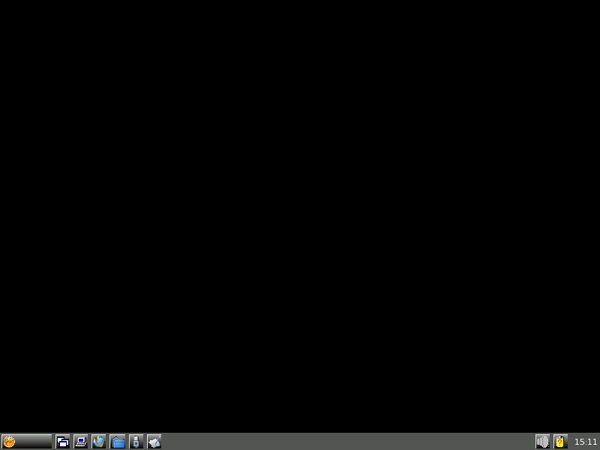 Notice the lack of desktop icons. They are not supported. Implementing them the way stock Puppy linux does would cost you about 6 MB RAM. On a Distro that is geared towards older hardware, perhaps with only 32 MB Ram total- this would be unacceptable, so desktop icons had to go. To make up for the lack of the icons you have a quick launch bar besides the Main Menu. The menu is accessed by clicking the yellow ball button in the lower left, or just right click anywere on the desktop. 6: Opens the Puppy mont tool for acessing USB- thumbdrives, CD, DVD, harddrives etc. If you can’t remember which is which, just hover over the button a second or two with the mouse pointer and a tooltip will show up. On the right side of the task bar you get a volume adjuster, a battery monitor and a clock. 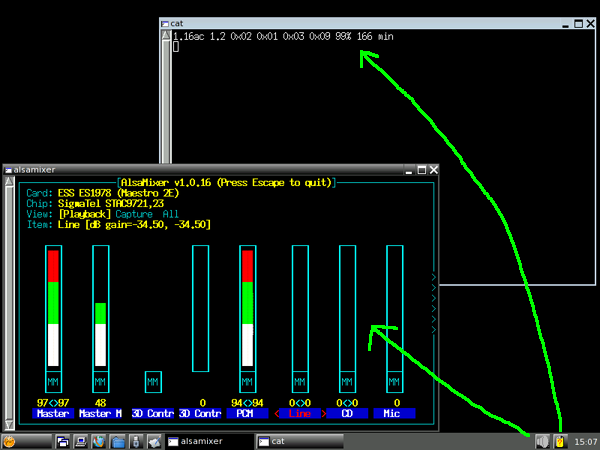 The volume adjuster is controlled by keyboard. Use the up and down key to raise and lower the Volume, use left and right to change the sliders. Press ‚m‘ to mute or unmute. The battery monitor is a simple output of /proc/apm. The last two numbers are of interest here. The second to last one tells you how much juice is left in your battery in percent. The last number is an estimation of how long your computer will run under battery (At least on my old laptops with a shot battery, these might be horribly wrong sometimes, so buyer beware…). The clock only shows you only the hours and the minutes to save on screen real estate, the tooltip, which pops up when you hover over the clock for a second or two contains all the info you want, date, time, day of the week etc.